Towering structures dubbed "Supertrees" partially block Singapore's financial skyline in a picture taken Wednesday. Ranging from 82 to 164 feet (25 to 50 meters) tall, the human-made, concrete trees are actually vertical gardens covered in tropical flowering climbers, ferns, and epiphytes—nonparasitic plants that grow without soil, using other plants or objects for support. 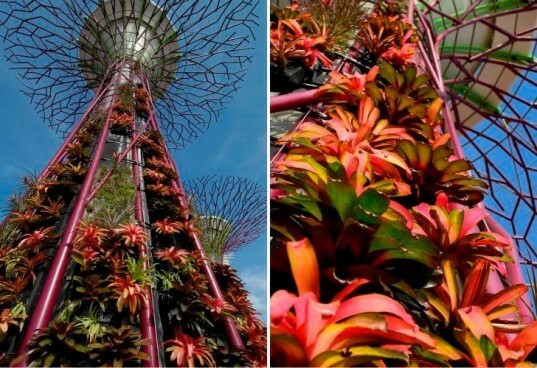 The Supertrees are part of the Gardens by the Bay, a government effort to bring a sampling of the national gardens into the city center, according to the Associated Press. 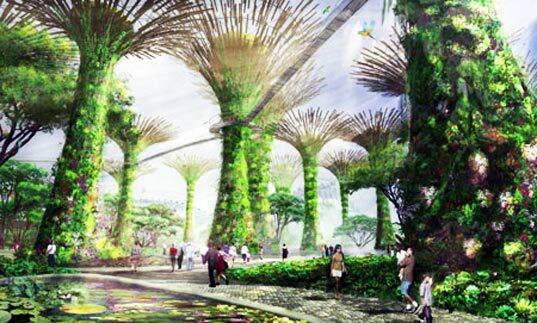 When the site is complete, it will host 18 Supertrees covered in more than 200 species and varieties of plant life.